This coffee will be fresh roasted for you. We expect Intelligentsia Coffee will roast and ship this coffee in 1-2 business days depending on their roasting schedule. 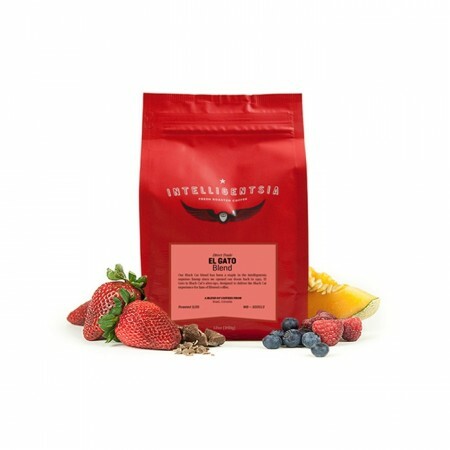 The El Gato Blend was blended and roasted for you by Intelligentsia Coffee. The El Gato Blend features Direct Trade coffees from Brazil and Colombia. The Black Cat blend has been a staple in the Intelligentsia espresso lineup since they opened our doors back in 1995. El Gato is Black Cat's alter-ego, designed to deliver the Black Cat experience for fans of drip coffee with notes of dark chocolate, baked apple and plum. Full bodied and flavorful, but a bit too darkly roasted for my preference. A well-balanced blended coffee for pourovers.